Northern B.C. is the place to drive in summer for long daylight hours, unspoiled wilderness and unlimited fishing, hiking and outdoor enjoyment. 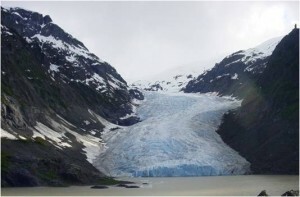 It also offers routes to the Yukon and Alaska – including the famed Alaska Highway – a highlight-of-a-lifetime road adventure. 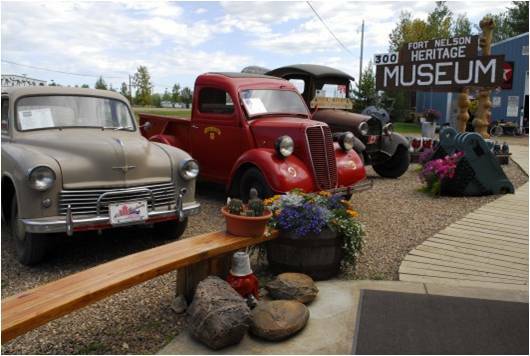 Here are some tips for motoring to the Alaska Highway and up the historic highway itself, to the Yukon. We’ve got a few points of interest for you, including B.C. provincial parks, which accommodate recreational vehicles. Once you’re onto the Alaska Highway, north of Fort Nelson, you’re getting into wilderness, so note the section further below for information about gas stations, rest areas, camping and some of the steeper hills. Note: The parks and attractions named below are a few highlights only. For more details, check out BC Parks and TourismBC. Keep in mind, while looking at maps, that Highway 97 is also called the Alaska Highway, as it travels north from Dawson Creek. Facilities and services can change over time, so you may wish to check with local visitor centres. Stay on top of road conditions and construction activity while travelling by visiting DriveBC on your laptop or mobile. Note that from Fort Nelson northward, internet connectivity is limited or unavailable. Should an emergency arise while you are in the Pink Mountain area, or any further north, don’t dial 911. (The 911 service is not available there). Instead, call Northern Rockies RCMP (250) 774-2777, BC Ambulance Service (250) 774-2344 or Northern Rockies Fire Rescue (250) 774-2222. Watch for wildlife – the north has many species of animals that could cross your path. Turn on your headlights in the day whenever visibility is poor – for example in rainy or dusty conditions. Most vehicles have daytime running lights but when you turn on your headlights, you’ll be easier to see from behind. West, Then North – take Highway 43 west and once you’re into B.C., the road becomes Highway 2 – the Dawson Creek-Tupper Highway. This route passes Swan Lake Provincial Park and Pouce Coupe, then enters Dawson Creek, Mile 0 of the Alaska Highway. North, Then West – take Highway 2 north, then turn west onto Highway 49. Shortly after arriving in B.C. 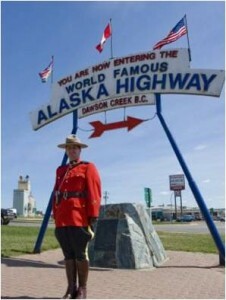 you’ll get to Dawson Creek, Mile 0 of the Alaska Highway (Also known as Highway 97). Another option from Grand Prairie is take Highway 2 north, pass the turnoff to Highway 49, then turn onto Highway 64. Highway 64 travels north then heads west, and once over the B.C. border, the route becomes Cecil Lake Road. Turn left onto Rose Prairie Road, which will take you onto and through Fort St. John. Keep driving through town and you’ll find yourself on Mile 45 of the Alaska Highway. Head north on Highway 97 from Prince George and drive 402 kilometres to Dawson Creek. Along the way there are some beautiful provincial parks. Whiskers Point Provincial Park has lakeside camping and lots of activities for children. Moberly Lake Provincial Park offers swimming and fishing in the lake and has an information kiosk about the area’s history, flora and fauna. This UNESCO Global Geopark is recognized as having internationally significant geological heritage. Palaeontology, geology and human history are all featured, with opportunities for hiking and driving tours. At Chetwynd, head south on Highway 29 to Tumbler Ridge and the geopark. Once you’ve explored the geopark, if you take Highway 52 back north to Highway 97, you’ve made a circle route. Driving the Alaska Highway is not the challenge it once was, years and years ago. (Ever seen those “I Drove the Alaska Highway and Survived” bumper stickers?) The road is now fully hard-surfaced, and over time more services have become available – but be aware that some gas stations can be far between. Dawson Creek is an excellent place to start your Alaska Highway journey and get information about Campgrounds and Gas Stations Along the Alaska Highway, so be sure to stop by the visitors centre to help plan your route. 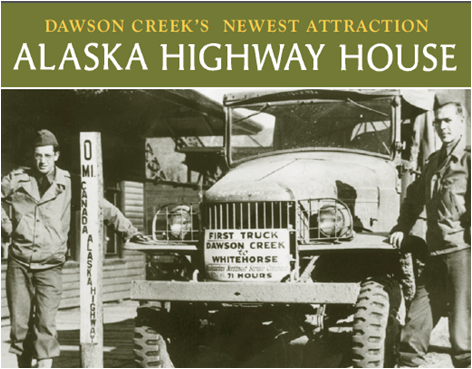 The town also has the Alaska Highway House which depicts the route’s rapid construction by 30,000 U.S. soldiers, along with Canadian civilians, during the Second World War. Kiskatinaw Provincial Park is a short walk from the Kiskatinaw Bridge, built by the U.S. military, as part of the Alaska Highway. The 30-metre high bridge was the first curved wooden bridge built in Canada and is the last curved, banked trestle bridge standing in Western Canada. Charlie Lake and Beatton provincial parks both offer swimming, fishing, hiking and boating and are located on either side of Charlie Lake. Mile 80 Rest Area is the last provincial rest area heading northward. Located by a river it has running water (not potable) and flush toilets. Check the nearby overhead message sign, for any road conditions further up the highway. Buckinghorse River Wayside Provincial Park is east of the foothills of the Rocky Mountains and is known for grayling fishing. Andy Bailey Regional Park and Campground has 12 un-serviced campsites, eight tent sites and a launch for non-motorized boats – a great place to picnic in a forested setting or for a quick fishing adventure. Tourism Northern Rockies is a great information source for Fort Nelson area and further north, and has a travel guide about private accommodations and regional parks, including Tetsa River Campground. Fort Nelson Visitor Information Centre near the Fort Nelson Museum offers free wireless internet service, and the latest information. This is the last TourismBC visitor centre for the rest of the Alaska Highway. Stone Mountain Provincial Park provides spectacular views of the Northern Rockies (hence the park’s name) and a good likelihood of spotting wildlife. 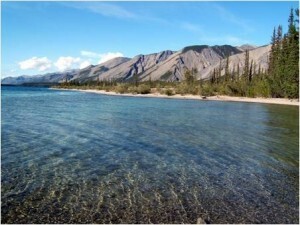 Muncho Lake Provincial Park is close to the highway and has two campgrounds near the 12-kilometre lake. Liard River Hot Springs Provincial Park is open all year long for northern travellers to soak and relax. Visitors reach the hot pools via a boardwalk which passes through boreal forest and a warm water swamp. 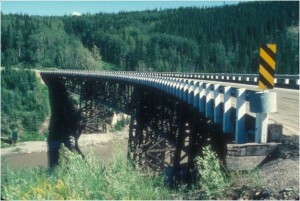 Hyland River Provincial Park is the last provincial park along the Alaska Highway, before the Yukon border. Watson Lake, Yukon has full services and repairs and is the junction to new routes. Want to See Even More of Northern B.C.? The Great Northern Circle Route links the Alaska Highway to Watson Lake, Yukon, with the scenic B.C. Highway 37 – the Stewart Cassiar Highway. The 725-kilometre route is hard-surfaced, with the exception of one kilometre of gravel, and has three provincial parks with RV camping. Fascinating side trips include Highway 37A to Stewart, touring through the Yukon to reach historic Atlin, B.C., and travelling Telegraph Creek Road as it follows the Stikine River through dramatic canyons, to reach the community of Telegraph Creek. If you’ve been hankering to see B.C.’s other northern neighbour, there’s the Deh Cho Travel Route where B.C. Highway 77 spurs off the Alaska Highway north of Fort Nelson, B.C., and goes through part of the Northwest Territories, then back south to Alberta. 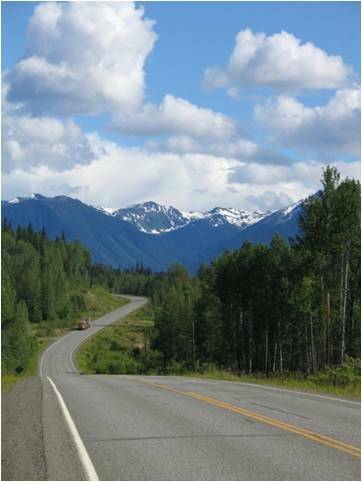 Going Further Along the Alaska Highway? You might want to look into the Milepost, which has guided travellers along the route since 1949, and is updated annually. Northern B.C. highways take you to remote places of breathtaking beauty and historic significance. The Ministry of Transportation and Infrastructure is pleased to contribute to safe passage for all modern-day explorers. my husband and I are planning to go from kitwanga to fort saint john..pulling our 35 fot trailer is this highway okay for that? Thanks for your question. Yes, BC Highway 16 and 97 are paved and regularly support large commercial vehicles. We encourage you to check DriveBC before you leave to get a better sense of current conditions and events along the route. Safe travels. Thanks for connecting with us here. Unfortunately, we don’t keep a list of this kind, but it should be easy to find info like this with a quick google search. Good luck and happy trails! I am planning/researching a trip to Telegraph Creek from Scotland possibly travelling May or early September 2016. Can you advise road conditions on Highway 37 & Highway 51 down into Telegraph Creek. I would be hiring a 4×4 for the trip. Any potential hazzards I should be aware of? Sounds like an exciting trip. The road to Telegraph Creek is gravel and should be driven with caution as there are switchback and steep cliffs, but in a 4×4 in May or September the weather should be fine. You might ask the 4X4 rental company for some tips, or search out a local forum for tips closer to the date? Happy trails! I am going to alasks on motor cycle are the roads good to travel and do I need to carry extra gas. I’d recommend you check drivebc.ca/mobile. It’ll give you an indication of how much construction is planned for that trip. And is it ever a bad idea to take extra gas? My wife and I are going to drive the Alaska highway next year in the summer. My car uses 91octane gasoline. Is that high of octane available in British ColumbiaAnd the Yukon on the Alaska Highway? A quick scan of 91 octane search results shows us that octane should be available to you on your journey. But to be extra sure, you might want to double check at specific points along your planned route.